Scottish satirical writer, essayist and historian. 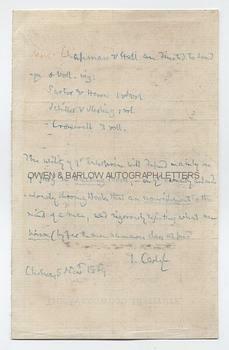 "Messrs Chapman & Hall are directed to send you 3 vols, viz: Sartor & Heroes 1 Vol, Schiller & Sterling 1 Vol, Cromwell 3 Vols. The utility of your enterprise will depend mainly on your judgement in earnestly and religiously choosing books that are nourishment to the mind of man, and vigorously rejecting what are poison (by far the more numerous class at present)." 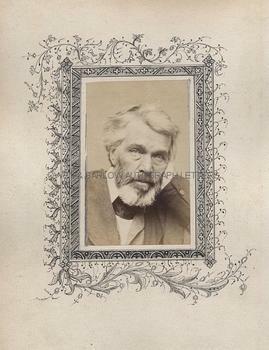 Together with a contemporary portrait photograph of Thomas Carlyle by Elliot & Fry, which is laid down on card within a border of fineoriginal penwork decoration. 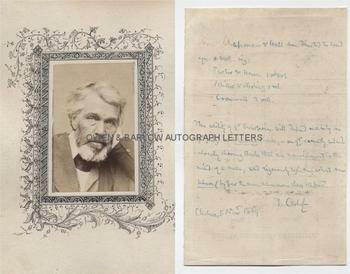 Both the letter and the photograph are from an album compiled by William Woodall, the radical Liberal M.P. and one of the trustees of the Wedgewood Institute. 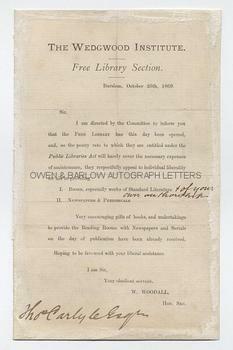 Carlyle's letter is in response to an appeal from Woodall on behalf of the Wedgewood Institute's Free Library and is written on the verso of Woodall's printed letter with autograph additions. In blue pencil on thin paper. Traces of mounting on verso, else near fine.